There’s something about the Jazzmaster that’s very relaxed. The overall style is incredibly appealing, with a solid alder body finished in glossy white and a ‘68 Stratocaster headstock adding a touch of vintage to it. The iconic Jazzmaster/Jaguar shape in particular is a nice change from all the Strats and Les Pauls you see in the beginner market, as it sports that distinctive asymmetrical body offering complete access to all 22 frets of the rosewood fretboard. This all sits on a very comfortable one-piece bolt-on C shaped maple neck, which is satin-finished, very sturdy and typical of most models associated with Fender. In fact, this is the prime reason we select this guitar on our chart of the best electric guitars for beginners – the incredible playability. Beginners need a comfortable and sleek neck, and this Jazzmaster really delivers. Squier have removed the old switching system on this Jazzmaster variation and stripped things down, meaning it’s simple for beginners to get to grips with. Both pickups are stock Squier humbuckers, which are nothing special but suitable at this price. These are controlled by a single master tone and volume control knob, as well as a three-way selector switch for choosing between the pickups. Elsewhere, Squier have opted for a six-saddle hardtail bridge with this Jazzmaster instead of the classic tremolo bridge. So, what you lose in vibrato effects, the guitar makes up for in tuning stability. On that note, the headstock is fitted with a set of sealed nickel tuners, which are fine to use – nothing special, but very acceptable. If you know anything about the Jazzmaster, you may be expecting a mellow vintage tone, perfect for surf-rock and similar genres. However, the two humbuckers are surprisingly hot, so this seems better suited to heavier rock and metal – which seems a bit odd for this model. Still, for beginners practicing and jamming, it’s not a bad thing at all. They are quite clear and have a decent overall output, although they may be worth upgrading as you improve. Squier’s affordable Affinity Jazzmaster is a little different to what you may have expected in terms of hardware and tone, but it’s a big winner in our eyes. For beginners, the playability and comfort of a guitar is what’s important, and this Jazzmaster seriously delivers on both aspects. Plus, it’s very affordable, and looks and sounds pretty cool, which is a good bonus! 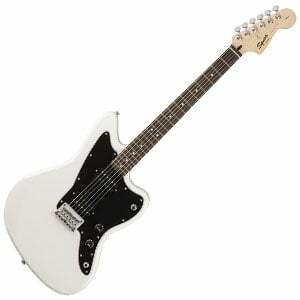 For more info about the Squier Affinity Jazzmaster HH, click here. For more electric guitars for beginners you might like, click here.